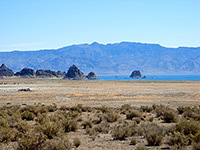 The medium-sized city of Fernley is situated in a valley close to the Truckee River, 20 miles downstream (south) of Pyramid Lake, a beautiful expanse of water with stark, desert surroundings. I-80 runs past a short distance north of town, the next nearest places being Reno 30 miles west and Winnemucca 134 miles northeast. One other water-based attraction nearby is Lahontan State Recreation Area, a large reservoir 16 miles south along alt US 50. Hotels, shops and restaurants are concentrated around Fernley's two interstate exits, the main location being on the east side, where stores include Lowe's and Wal-Mart. The Best Western hotel in Fernley, NV, is located at the northeast side of town, close to the start of the desert plains at the edge of Fernley Sink, and enjoying mountain views to north and east. Downtown Fernley is 2 miles west. The exterior corridor hotel has 66 rooms (some with refrigerator/microwave), landscaped gardens, a sundeck, indoor pool & hot tub, and a dining area for the free continental breakfast, which includes hot waffles. A selection of the rooms are designated pet friendly; a small fee applies. Recently built (2009) Comfort Suites Fernley accommodates guests in 84 oversized, nicely decorated rooms, all equipped with a microwave, refrigerator, wet bar, coffee maker and pillow top mattresses. Some have a sofa bed and whirlpool bath. The hotel has a quiet location along a side road just off US 95 on the west side of town, one block from I-80 (exit 46) and 30 miles east of Reno. Free deluxe continental breakfast is served each morning, and other meals are available from the restaurant at the nearby Love's Travel Stop. A heated indoor pool, fitness center, business center and meeting space are some of the other facilities. Super 8 Fernley occupies a distinctive, red-roofed building of 49 rooms on two exterior corridor floors, near the easternmost of the town's two I-80 exits; adjacent to a casino, close to several restaurants and just across the street from a Wal-Mart superstore. All guest accommodations contain a refrigerator and microwave. The pet friendly motel has an indoor pool and provides free continental breakfast. Wi-fi is also complimentary.